The small Conshohocken electronic-payments firm would not disclose the terms. Employees would stay on. 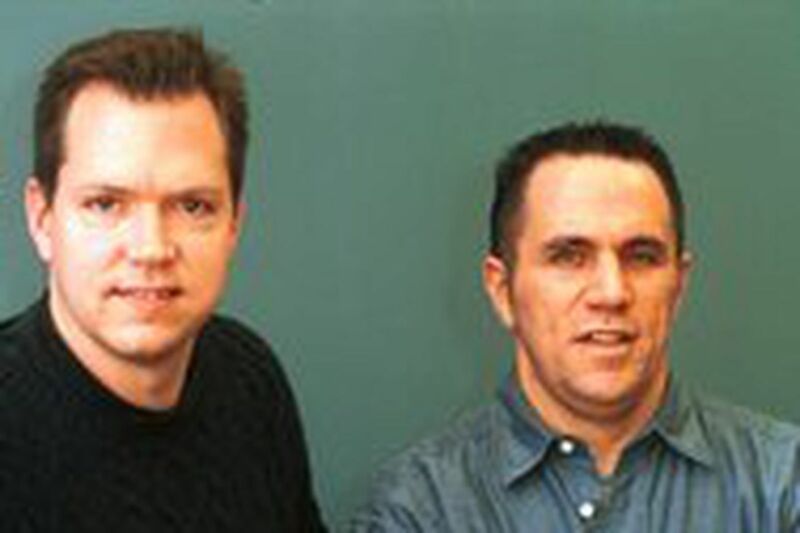 Matt Gillin (left) and Paul Raden in a 2002 photograph. They started Ecount, an electronic-payments firm,in 1995 in Gillin's parents' basement in Bryn Mawr. Matt Gillin and Paul Raden built their technology start-up, Ecount Inc., during the Internet boom and survived the bust. Today, Citigroup Inc. is expected to announce it has acquired the small Conshohocken electronic-payments firm. Neither Citigroup, now called Citi, nor Ecount would disclose the financial terms, but when the acquisition closes later today, the investors and founders, Gillin, 40, and Raden, 45, stand to make millions. "What's great about the whole story is that the company was founded in a basement in suburban Philadelphia by two Philadelphia guys," Gillin said. "Various family members, including uncles and cousins," put money in. "What's great about this transaction when it closes is, everyone is going to win on it." Ecount will become a Citi company, remaining in Conshohocken, with a bit fewer than 100 employees, at the former Lee Tire factory, now an office complex. Gillin, Ecount's chief executive officer, and Raden, the chief marketing officer, will continue to run the firm. Investors, including NewSpring Capital and Cross Atlantic Capital Partners, both of Radnor, and Masthead Venture Partners L.L.C., of Cambridge, Mass., could receive up to 10 times their original investment, which totaled $15 million, people familiar with the transaction said. Citi, one of the world's largest banks, said the acquisition would strengthen its position in the corporate prepaid-card-payment business. That market is growing and currently estimated at "more than $2 trillion worldwide as corporations and consumers continue to move from paper checks to electronic-based payment methods," Citi said in a statement. Cross Atlantic founder and managing director Gerry McGrory said Ecount was a great investment. "We're delighted with management, a great team. Matt and Paul are excellent entrepreneurs. "It's an excellent deal," he said. "Everybody walks away with a lot of money. I wouldn't think anybody is unhappy with the deal." When NewSpring Capital invested in Ecount in February 2001, the firm had $2 million in revenue and was losing money, recalled Glenn Rieger, general partner at NewSpring. Revenue last year was about $30 million. Ecount provides prepaid MasterCard and Visa cards to more than 1,200 corporations, including Toyota Motor Corp., Sprint Nextel Corp., Ford Motor Co., and more than one-third of the companies in the Fortune 100. The plastic cards are customized with a company's name and used, instead of paper checks, to pay rebates, rewards, incentives, bonuses, and compensation to people who may be customers or employees. Ecount started in 1995 in Gillin's parents' basement in Bryn Mawr. "We set up an office down there and tried to figure out what we were doing," recalled Gillin, while attending a meeting in Las Vegas. Raden, another Philadelphia-area native, grew up Chester Springs. Gillin got a bachelor's degree in history at Denison University, and Raden was an English graduate at Notre Dame. They met in 1993, when they began working at a financial-services firm in West Palm Beach, Fla. In 1995, after developing a single card that combined the meal plan, dorm access, ATM, student ID and phone card for college campuses, the two left Ocwen Financial Corp. to start a consulting business. They partnered with credit card companies, such as MasterCard Inc., and with Internet companies, such as Amazon.com Inc. and Microsoft Corp.
"The Internet was just starting to grow and get really big," Raden said. "We had a background in cards and card products. We went to Internet companies and said, 'Hey, we can partner you with a large credit card company.' "
In 1997, after getting angel financing from family members, Ecount moved to Conshohocken and, the next year, introduced its first product: a virtual debit card, called a Webcertificate, that could be used to make purchases on the Internet. In 1999, Ecount began offering prepaid plastic cards similar to gift cards consumers buy. The difference is, Ecount caters only to corporations, not individuals. "Why do businesses love it? Because they get their brand on the card, and every time the card is used, that company's brand is reinforced over and over, which they don't get with a check," Raden said. "They also get to deliver the payment more cost-effectively than a check, and much faster." Ecount said in a release on its Web site that 2006 was its most successful year, with "record-breaking revenue" and client growth. In December, Gillin was named 2006 technology "CEO of the Year" by the Eastern Technology Council, a Wayne group that provides support services to companies. Gillin and Raden are "very good managers, very thoughtful, diligent and hardworking," Rieger of NewSpring Capital said. "They know the marketplace they are dealing with inside and out. And they motivated a great group of people in Conshohocken." Gillin is sanguine when he talks about the Citi acquisition. "Honestly, we always knew that we would get here someday, so I'm somewhat reserved about it. What's really the coolest part is all the people who contributed along the way." He gave credit to the hard work of all the employees at Ecount: "It's one of those once-in-a-lifetime things, so it's major for the whole team."